For the first half of its District 4-AAA basketball game against rival Halls the Powell High School girls basketball team struggled. The Lady Panthers were down by two points at halftime. But a halftime pep talk from coach Chrstin Webb was all that Powell needed to spark a big second half and result in a 54-30 victory over the Lady Devils at Jim Hunter Gymnasium. The Lady Panthers (7-4 overall, 4-1 in the district) did enough early to open a 12-9 first quarter lead at home against their rivals but the Lady Devils (4-7, 3-2) mounted a second-quarter rally and took a 20-18 lead thanks in part to the efforts of Panda Riggs and Griffen Parker. Parker had seven of her eight points in the second stanza while Riggs, the only Lady Devils player to post double figures in the contest had four of her 11 points before halftime. Harper Cherry had five points over the first 16 minutes for Halls but she was completely silenced after the break. The Lady Devils took a 23-18 lead when Riggs nailed a long-range jumper to start the third quarter before Powell’s defense was able to clamp down and stymie the Halls High offensive attack. After Riggs converted her third-quarter 3-pointer, Powell defense surrendered just seven points throughout the rest of the contest. “In the second half, Powell came out and turned up the heat,” Halls coach Randy Moore said. “In the second half, Powell came out and played hard and our girls were passive. Halls managed to score just one point in the final period and that was a free throw by Parker. The Lady Panthers closed the game with a 19-1 run. Brooke Huffaker buried three 3-pointers after halftime and scored 11 of her 13 points over the final 16 minutes to give the Lady Panthers the spark that they needed to notch a crucial home league win. 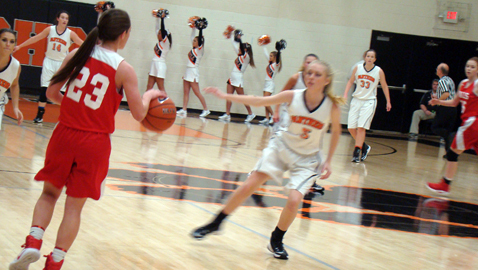 She was one of three Powell players to post double figures in the scoring column. Haley Schubert led all scorers with 14 points and Kaitlyn Lentz finished with 10.